OK, if you're reading this I'm assuming you've seen the opening episode of series 3 of Luther. If not then I suggest you watch it now as I'm about the most exciting elements of the plot. I actually saw this first episode at a screening. The room was quite literally buzzing with excitement. I'll admit I wasn't instantly a Luther fan. If you search on the site you can read my less than glowing review of the first episode of series 1 which aired in 2010. If you don't fancy searching I can tell you I found that first episode clichéd and I felt we'd seen the maverick rebel policeman thing once too often. For some reason I stuck with Luther and enjoyed it so much I felt compelled to write again, this time praising the series. I had realised to enjoy Luther you have to let yourself enter his madcap world. The world Luther lives in is utterly crazy and just about believable enough so that we don't feel what's happening is completely implausible. It took me a series to realise this but once I did I thoroughly enjoyed and relished each episode. The change of format in series 2 seemed to suit it a lot better. The two-part episodes allowed the stories and characters to develop at a better rate. The other thing that I think sets Luther apart from other series in the genre is the fact that it is genuinely exciting. There were moments in the second series that saw me literally open mouthed and judging by some of the terrifying and exciting moments in this first episode I'm sure series 3 will leave me just as speechless. This first episode felt more like a horror film than a piece of television crime drama. As a woman enters her flat, turns on the light, looks around as if she feels she's being watched and slowly puts on the kettle. If we've learnt anything from Luther in the last few years it's that you're never safe, and as our soon to be victim boils her kettle we are already aware she's in danger. The brilliance in this opening scene is the fact that the tension is building in complete silence. Other shows might be tempted to give the audience further clues with sinister music cues or the flash of a shadow, but the silence is almost a character itself and I'm aware I'll leap out my skin any minute. An agonising amount of time is spent in the flat as our victim closes her curtains, slowly kicks of her shoes and unzips her dress. As we watch her climb into bed we're acutely aware that she's going to meet an awful end. But when? Surely something will happen any second? The woman is now in bed. Perhaps I'm wrong, perhaps she's safe now. Just as I started to relax the jump I had previously anticipated happens. A man slithers, as if on castors, from under her bed! He's been lying there waiting to pounce the entire time. It's fair to say everyone at the screening was genuinely spooked and shaken by this. It's a very creepy and brilliantly done piece of directing. As the man from under the bed looms over his sleeping victim she opens her eyes and looks of terror consumes her face. It's then we are launched into the wonderful opening theme from Massive Attack and just like that, we're back in Luther's world again and ready for the ride. When Luther (the always brilliant Idris Elba) and trusted sidekick DS Ripley (the equally brilliant Warren Brown), arrive at the victim's flat the following morning, she's lost her shoes, is wearing a bad black wig and has an odd mask on her face. We're less than ten minutes in at this point and I'm already hooked, and just about resisting the urge to rub my hands together with glee that Luther is back. Just as I'm getting comfy Luther is pulled away from the case and put on another This was one element of the script I didn't like. As Luther leaves the scene Ripley gets a phone call. We as an audience don't hear the exchange but in the next scene Ripley arrives in a grey car park where he meets DS Erin Gray. We last saw Gray in series 2 and it appears she's taken a turn in this new series and is now part of what Ripley refers to as "The Judas Division." We quickly learn this means Gray is out for stitching up dirty coppers and I have a sneaky feeling I know where we're going to go from here. As Gray introduces Ripley to the formidable George Stark I feel a little deflated. I don't want to see Luther investigated I was so interested in and excited by the opening scenes that I really just want to see Luther and Ripley delve deeper into the mind of our killer. Nevertheless Stark threatens Ripley and he agrees to wear a wire to hopefully catch Luther up to no good. 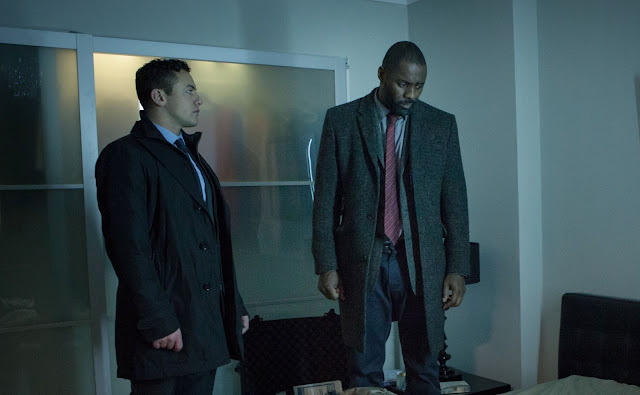 It's clear that Stark (a man not to be messed with), has orchestrated Luther's second case and I begin to feel a little dismayed as it appears the series will go down a path tread so many times by other crime dramas. 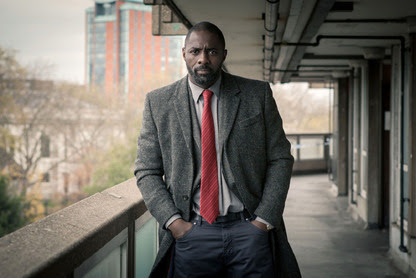 We knew quite early on that Luther would be getting a love interest this series and whilst this was also something I was initially resistant to, giving Luther a new lady in his life has allowed writer Neil Cross to uncover a lighter and gentler side to the character and inject some humour into the dark tone of the episode. the otherwise dark themes of the episode. Humour is actually evident throughout the majority of the script. There's some nice one liners between Luther and Ripley as they banter back and forth. Actor Warren Brown spoke to me about the lighter more humorous elements of the script. "Since the first series Idris and I have become really good pals. We knockabout together when we're not at work and that definitely helps as we have banter between each other in real life." Before too long we're back to the main storyline I had relished so much in those tense opening scenes. This time a woman begins to feel uneasy as she writes at her kitchen table. The room is open-plan and looks over her immaculate and warmly lit garden. We know from the camera angles that our killer is lurking again. The brilliance of Luther is the fact that even though the audience know the killer and know something is about to happen we're also put in the shoes of the victims because we never know where, when or why. The scenes that follow are gut wrenchingly brutal but truly exciting too. Another scene that deserves a mention saw a man purposely put his hand into a blender to destroy his fingerprints. There was an audible gasp in the screening room as he reached over and plugged it in. Some may criticise this first instalment for being too gory or perhaps over the top but actually I don't personally feel the series ever pushes things too far. Of course it's fair to say some elements of it are bonkers but you could say that about some elements of Sherlock too. What Luther is, is a brilliantly written, macabre and exciting hour of television spent with a strong cast and a brilliant attention to detail. Whilst I felt some parts of the first episode "were clichéd I was so hooked and on the edge of my seat for the other half that already this series stands out as one of my favourite dramas of the year. Wherever the series goes from here I'll be along for the ride.